Daniel Ellsberg, center, former military analyst who released the "Pentagon Papers" joins the anti-war protest. 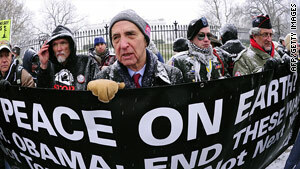 Ellsberg says he regards the latest leaks "as a very admirable act"
Washington (CNN) -- Police arrested more than a hundred protesters during an anti-war demonstration outside the White House fence Thursday. The event was part of a rally that also was in support of WikiLeaks founder Julian Assange, whose website has revealed secret U.S. documents about Iraq, Afghanistan and other countries. "This lynch mob mentality is America at its lowest," said Daniel Ellsberg, a former military analyst who, a generation ago, leaked the "Pentagon Papers" to The New York Times. Ellsberg, now 79, told reporters this would be his 80th arrest for civil disobedience in the time since his revelations helped shed light on how badly the war in Vietnam was going for the United States. After a noisy but peaceful demonstration involving a few hundred people, police ordered the group to disperse. Those who refused were then placed in plastic handcuffs, led to a processing tent during a snow shower, photographed and placed on a bus for transport. Police continued to clear the demonstrators nearly two hours later. U.S. Park Police spokesman Sgt. David Schlosser later told CNN a total of 131 people were arrested and charged with failure to comply with a police order. Most, if not all, were expected to admit guilt, pay a $100 fine and be released. Before the protest began in nearby Lafayette Park, Ellsberg held a news conference with an Australian group that had placed a full-page ad in The New York Times calling for fair treatment of Assange as he fights potential legal action as publisher of secret materials his website received. The activist group GetUp said nearly 95,000 of his countrymen have signed a statement of support for him and for the concepts of free speech and presumption of innocence. Ellsberg said there are parallels in the WikiLeaks case with what he went though in 1971 when he supplied The New York Times with details of a top-secret Pentagon study of U.S. decision-making during the Vietnam War. He said of the latest leaks, "I regard it as a very admirable act," and added he believes the person who supplied the information to WikiLeaks acted out of the same obligation "to inform the American people." And where the Nixon administration had The New York Times as a clear target for the Pentagon Papers, he said the "effort now is to distinguish WikiLeaks from the establishment press in order to prosecute." He called that effort "a fool's mission," since Assange is a digital publisher. The right of The New York Times to publish the Pentagon Papers was eventually upheld by the U.S. Supreme Court. "When I revealed the Pentagon Papers, I thought at most there was a very small chance that it might have an effect on the war, just as sure Bradley Manning didn't have any guarantee what he's doing would have any effect, but he was ready to go to prison for life to have some small chance of doing it," Ellsberg said. Manning, a U.S. Army private first class, is a suspect in the WikiLeaks disclosures. He is awaiting trial in a Virginia stockade in connection with earlier WikiLeaks revelations he is accused of involvement with. He has not admitted guilt in either incident, his supporters say.